I somehow disagree with Buddha on some portions. His quotation is so broad. If Buddha is alive I would have asked him to clarify more details for example, what he meant by “living beings?” Did he include all fish, cow, pig, …etc.? How about the buyers or eaters meat from the markets? If they don’t buy and don’t eat meat, there would not be butchers go to harm or kill the pig or cows and sell the meat for us to buy and eat. Our bodies’re designed to be fed to keep our bodies alive. Buddha is more like a philosopher, but his philosophy is flawed. Don’t give me wrong. I was born in Cambodia from a Buddhist family, but I have not seen a single Buddhist soul has practiced Buddha teachings. I’d say 99.999% have no fear of doing evils toward one another. I am talking based on my experiences when I lived at my home land who adopted Buddhism since in late 13th century. Sounds so good, but I didn’t see any change but worse. Unfortunately people’s attachment to the habit of eating meat is very strong, even in Buddhist countries. Most Buddhists I know in the US are vegetarian or vegan, however. I think this is because their Buddhism is has had to be adopted as a conscious choice, and thought through, rather than simply being adopted as part of the culture they’re born into. I agree with you that the Buddha condemned the butchering of animals.However i have not heard of a sutra which explicitly condemns eating or buying meat. Meat eating was a prevalent practice in those days. I would be surprised if the Buddha had not advocated against it explicitly if he had truly wanted to. I would also like to point out that any and all of our actions can be linked in some way or the other to the death of a “breathing being”. For example, if you buy land and build a house you are invariably destroying a few ant hills and displacing ( causing suffering ) of other species of animals and birds. Another example would be the use of fertilizer to kill off insects. Even a staunch vegetarian must eat vegetables from the farm. If what you say is true, then it would be impossible for us to live our lives at all. To the best of my knowledge, the Buddha again did not condemn this. That being so, i believe the Buddha placed emphasis on the mental states of the actions along with the actions themselves. So it is my view that Buddha never condemned the eating of meat but condemned only the butchery of animals. I even recollect a story i read long ago that a monk must never accept meat for his alms meal if he knows/doubts that the animal was killed especially for his satisfaction. However, if the animal was killed for the family and only the remnants are given to the monk then he can accept the offering. Awaiting a reply. If possible, pls refer to which sutra you took it from. Thank you Bodhipaksa. You’re essentially asking for an essay-length response, complete with references, and actually I’ve already written a short book on this topic, which I’d suggest getting hold of. Although at the moment I’m working on the third edition, so you might want to wait until next year. 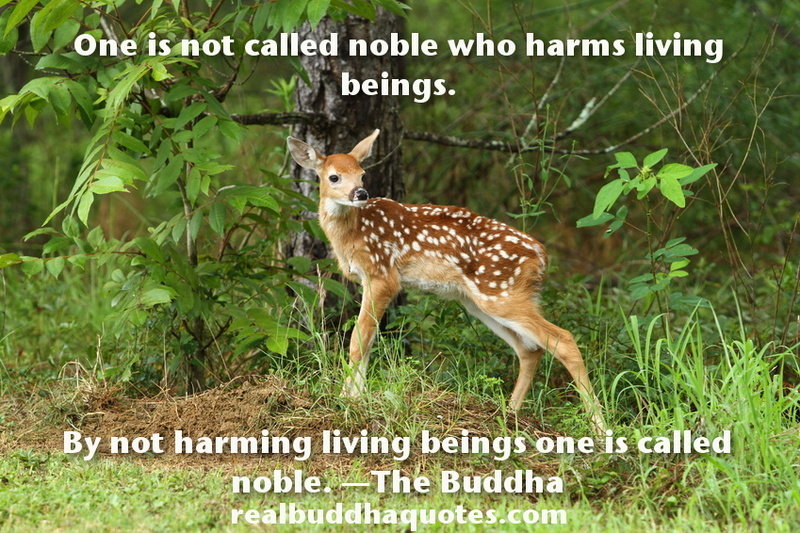 Anyway, to give just brief responses: the Buddha said many times to householders not only “not to kill” but also “don’t cause others to kill.” How does one eat meat if you’re neither killing animals yourself not getting others to kill them for you? The Buddha, as you note, also explicitly condemned the job of butcher (and even trade in animals) as wrong livelihood, and even as “evil.” Does it make sense for Buddhists to directly support those who engage in wrong livelihood? It is OK to employ a poisoner to dispatch an enemy? Is it OK to buy guns but condemn the arms-dealer for selling them to you? Is it consistent to say that butchery is unethical and then financially reward the butcher for his work? Yes, many of the things we do cause the death or injury of animals. Some of that (such as meat eating) is avoidable, and some of that (e.g. building houses or growing crops) is not. Why use unavoidable harm as an excuse for committing avoidable harm? Where’s the logic in that? That’s like saying that because people will inevitably get killed in car accidents, it’s therefore OK to deliberately kill someone by driving your car into them. In addition, because it takes a large amount of plant food to feed animals, in order to produce a relatively small amount of meat, eating meat causes far more harm (you can safely assume it would be in the order of seven times as much) than directly eating those crops. So if you’re genuinely concerned about the welfare of insects, then you’ll immediately become vegetarian (unless of course that argument was specious, and intended simply as a rationalization, in which case you’ll shrug and continue eating meat as if you’d never even made that argument). It’s one of the biggest misconceptions about Buddhism that the Buddha only placed stress on the mental states that are behind our actions. He also insisted that we look at whether our actions are causing harm. If they are, then we’re to make a confession and undertake not to repeat that action. That’s from this sutta. So the point is, just because a person rationalize the harm they’re causing through eating meat, and consider their actions to be pure, that doesn’t mean that’s the case. If their actions involved a) craving to eat an animal’s body, and b) a lack of concern that an animal has been killed in order to satisfy that craving, then I think it’s safe to assume that there’s an unacknowledged unskillful state. The act of looking at the effects of our actions helps bring those into consciousness so that we can address them. If anyone slaughters a living being for the Tathagata or his disciple, he lays up much demerit in five instances. When he says “Go and fetch that living being” … when that living being experiences pain and grief on being led along with a neck halter .. when he says “Go and slaughter that living being” … when that living being experiences pain and grief on being slaughtered … when he provides the Tathagata or his disciple with food that is not permissible … Anyone who slaughters a living being for the Tathagata or his disciple lays up much demerit in these five instances. The concern here is with the wellbeing of the animal! Under what circumstances could we imagine the Buddha saying that it’s OK to cause an animal to suffer in this way? If you’re getting someone else to do it? No, that’s covered. If the meat is bought in a supermarket and you didn’t actually have to say to someone “please kill this animal”? No, the animal still suffers, and preventing that suffering was the Buddha’s concern. That would be true if the Buddha was an idiot. But he wasn’t an idiot. He knew that if we are to live, some suffering was avoidable and that some was unavoidable. The slaughter of animals is avoidable. “Buddha never condemned the eating of meat but condemned only the butchering of animals”. Read that again and see if it makes sense to you. Not The Buddha mean .its you mean .let me ask you somsomthing ,have you ever meet buddha?? Of course – it is obvious that buying meet we were supporting harming animals. Since some time people have technology to switch from animal to a plant food and have a fully healthy nutrition with such a food. It was not possible all the time and some people had to kill animals. But the situation changed. Now you tell that in your Buddhist country nobody you knows lives according to the Buddha teaching. So what? Most of the present people are still traditional but not really spiritual and even not really religious, they are not compassionate enough. In middle ages they killed and tortured people considering it to be the only possible way of life. Now they widely grew out of it, but still kill animals. If humanity do not destroy itself once comes the day they will stop killing animals. Some noble, compassionate people did it already now and it is up to you to decide how you live if you have enough compassion and courage to live your own life and not the one which were imposed upon you by other in your family, circle, region, country , etc. Buddha was not philosopher. His teaching is not a product of long or intense and sophisticated “thinking”. It was born out of meditative insight into his own nature, into the bases of consciousness, backed by extreme physiological and psychological experiences and people knowledge. “Once you understand non-self, then the burden of life is gone. You’ll be at peace with the world. When we see beyond self, we no longer cling to happiness and we can truly be happy. Learn to let go without struggle, simply let go, to be just as you are – no holding on, no attachment, free.” ??? I can’t understand how you are unable to see the logic in this. My point is that NO action can be treated as wholly good or wholly bad, by looking at only the physical action,if the mental states are not taken into account. If you look at the pesticide example, one only needs to go a few steps further in the economic chain to find that the landowner of the farm owns a meat factory. So are you actually sponsoring the factkry Every act is physically connected to every other act. So there is no way to label an act as good or bad by merely seeing the external repercussions of the act. In fact, then how do you distinguish whether the act is good or bad ? By the mental states that accompany it, is it not ? If you save a drowning woman, out of sympathy for her life, then it is a good act, however if you save her so that when she reaches the bank you can steal her jewellery then it is a bad act, because all the time that you were saving her, it’s only because of your own greed. Every human being (including the Buddha) who has ever lived in this world can be shown through his/her PHYSICAL ACTIONS to have caused incalculable harm to other beings. But what was different with the Buddha was that his mind never gave way to any of the taints like anger, hatred etc…. I can’t understand how you are unable to see the logic in this. My point is that NO action can be treated as wholly good or wholly bad, by looking at only the physical action,if the mental states are not taken into account. If you look at the pesticide example, one only needs to go a few steps further in the economic chain to find that the landowner of the farm owns a meat factory. So are you actually sponsoring the factory by buying his vegetables ? Every act is physically connected to every other act if you go deep enough. So there is no way to label an act as good or bad by merely seeing the external repercussions of the act. In fact, then how do you distinguish whether the act is good or bad ? By the mental states that in you that accompany it, is it not ? If you save a drowning woman, out of sympathy for her life, then it is a good act, however if you save her so that when she reaches the bank you can steal her jewellery then it is a bad act, because all the time that you were saving her, it’s only because of your own greed and with little care for her life. Every human being (including the Buddha) who has ever lived in this world can be shown through his/her PHYSICAL ACTIONS to have indirectly caused incalculable harm to other beings. But what was different with the Buddha was that his mind never gave way to any of the taints like anger, hatred etc ie his intentions towards other beings and his mental states were always pure. In the case of eating a hamburger, why on earth should one take responsibility for the cow’s butchery. If one starts to look at things that way, then if one digs deep enough, not one action can be labelled as righteous and one will only be mired in guilt. Meat eating, vegetarianism all are same – in first case, you eat the meat directly, in second case, you are probably sponsoring the butcher factory owned by the landlord of the vegetable farm. So what’s the difference ? Oops my bad.Din’t notice that the first comment had come out… Ignore one of them… Almost the same.. Eating meat while trying to practice compassion leads to the cognitive dissonance being witnessed here. Speaking from my own experience: becoming vegetarian was the easiest thing I’ve ever done, it was the ‘thought’ of it that created the greatest hurdle. It’s not expensive anymore and so many great tasting meat substitutes are available that your conscience doesn’t have to take a hit for. They’re so close to the same thing that it really begs the question ‘if your craving for a particular meat-flavor sensation can’t be substituted for a nearly identical substance, how much compassion will it take for one to overcome that grasping?’ I see this as a matter of personal growth and learning to stretch the arbitrary boundaries we place around ourselves. We live in a meat saturated culture and it can be hard to break the social paradigm. Try just going meatless one or two days a week to get the feel of it? I do believe that changing our relationship with animals from viewing them as an abstract product, to that of a sentient being with feelings, makes one more sensitive to everything else one might experience in life.